Check, Please! Book 1: #Hockey review: A testament to how good comics can be – AiPT! An engaging story of college sports, friendship, and love. I’ve heard a lot of good things about Ngozi Ukazu’s Check, Please! ever since it debuted back in 2013. Unfortunately, with all the print comics I read, I’m pretty bad at getting around to reading webcomics. Fortunately for me, First Second Books has released the first of two print collections of the series: Check, Please! Book 1: #Hockey. The collection contains the first two “seasons” of the comic, which chronicle protagonist Eric “Bitty” Bittle’s freshman and sophomore years at Samwell University. When Bitty’s not vlogging about his life he’s baking, and when he’s not baking he’s practicing and spending time with his teammates on Samwell’s men’s hockey team. Both comedic and heartfelt, the comic is a sincere look at college life and the bonds between athletes. So, how is its first collection? Character-wise, this volume covers a massive amount of ground. Not only do we get to know Bitty, we get great introductions to almost all of his teammates. Ukazu does a masterful job of establishing characters’ personalities and relationships. They all have distinct speech patterns, vocal ticks, and mannerisms, which helps the dialogue ring true. Especially impressive is the fact that, though this is a comedic series, none of the characters are relegated solely to comic relief. They’re all multidimensional, so a character who is a source of humor in one scene can also be at the center of heartfelt sentiments in the next. All of the depth provided for each character makes it very easy to love the Samwell men’s hockey team. Speaking of love, there’s the comic’s main romance: the one between Bitty and the team’s captain, Jack Zimmermann. It’s built up very slowly and subtly, to the point that it’s barely present here. The two only confess their affections for each other at the very end of the volume. It’s one hell of an ending though, and it left me eager to read the rest of the series. As far as the buildup to it goes, Ukazu does a good job of hinting at the characters’ crushes without making it obvious that they’ll get together, thus allowing readers to share in the characters’ sense of unease. Jack’s emotions are especially subtle, making Bitty’s surprise at the end all the more relatable. Check, Please! also does a fantastic job establishing its college athletics setting and atmosphere. Several different team and campus traditions are incorporated, which helps convey college life’s sense of quirky fun. The sports information is also well-handled. You don’t need to be a hockey fan or have even elementary knowledge of the sport to appreciate this comic; Ukazu weaves in all the necessary context smoothly and gradually so that the reader can develop a basic understanding of hockey without having to suffer through an exposition dump. This is also a lovely book, visually speaking. The characters look fantastic, and Ukazu’s work on their facial expressions is near perfect. There’s so much personality on every page it’s infectious. The art only gets better as the book goes on, too. Though it’s already charming early on, the line-work gets exponentially cleaner over time, and one can see Ukazu polish up her style. The coloration also gradually grows more and more dynamic. There is very little to criticize here. Of course, as with any humor comic, some strips are more successful than others. With that said, there are very few weak links in this collection. The same holds true for the art; while there are some occasional off faces or panels where Ukazu tries out a shading effect that doesn’t quite work, these are few and far between, especially in the book’s second half. Check, Please! 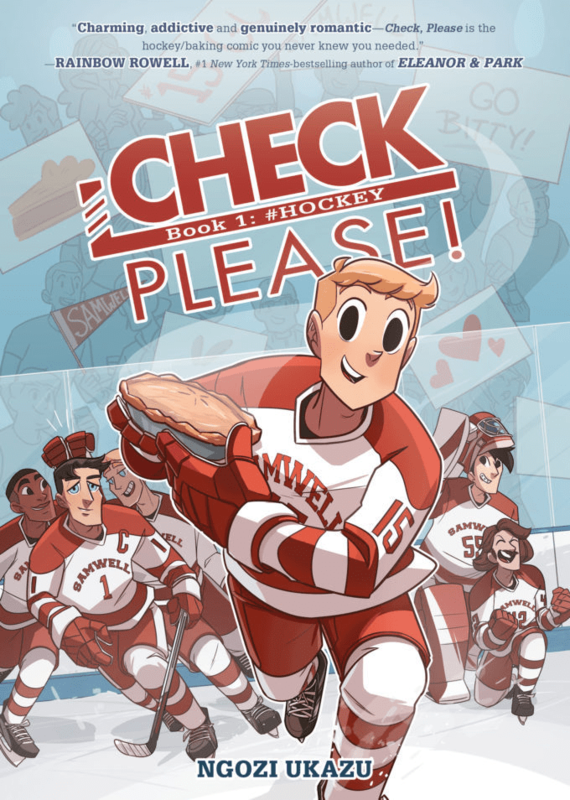 Book 1: #Hockey is a testament to the potential of sports comics, webcomics, gay comics, and comics in general. From its characters to its setting to its artwork, every aspect of it starts out strong and just gets better as Ukazu further hones her storytelling skills. The funny scenes are joy-inducing, the emotional scenes are heart-wrenching, and the overall experience is one that can’t be beat. A testiment to how great sports comics can be. Hilarious, heartwarming, and hard to put down.